A month of changeable weather, with the dampness producing a fantastic array of fungi in the woodland. Included are the Jews ear, especially seen on old Elder trunks, Wood Blewit with its slight slimy cap and pale purple colouring, plus the deadly (and to be avoided) Death Cap, a greenish tinge giving it away. In the canopy tops, tiny Goldcrests arrive in numbers along with an occasional Firecrest, also a good selection of warblers with Chiffchaff, Blackcap and Wood Warbler often in evidence. 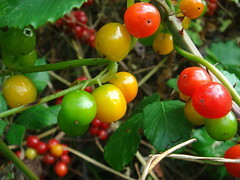 Hawthorn trees laden down with haws, sloes (Blackthorn), the orange of the Stinking Iris and vivid pink of Spindle provide blasts of colour as well as food. The white Old Man's Beard entwines its way across the berry clad Hawthorn, Dog Rose and Bryony, where Redwing and Fieldfares spend their day. An occasional Ring Ouzel may join them, as do other Thrushes - Song, Mistle and Blackbirds. Field Mushrooms and Parasols emerge on the downland slopes where a Bloody-Nosed Beetle may trundle. Scarlet Pimpernel sometimes flowers on the eroded paths. Scabious, Knapweed, Wild Carrot and Fleabane still flowering in the uncut areas of the meadows, where Linnets, Goldfinch and Yellowhammers are often feeding on the seeds of Teasel, Woolly Thistle, Bristly Ox-Tongue and umbellifers. The open meadows sustain Meadow Pipits, Grey and Pied Wagtails and flocks of Skylarks. Overhead late Swallows and House Martins feed up before flying southwards. Early morning seawatching in rough weather always produces a steady flow of ducks - Teal, Scoter and Wigeon, plus the exciting Great and Pomarine Skuas. From the east come Brent Geese, while Guillemots may be revisiting the area on occasions. 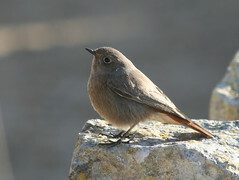 The autumn is usually a good time for watching the Bottlenose Dolphins (any reports please), and often a Black Redstart is seen around Tilly Whim caves. 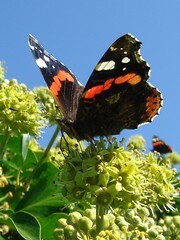 Occasional late butterflies such as the Clouded Yellow or Brimstone can fly over on the sunnier days, and the Ivy blossom attracts Bees, Hoverflies and Butterflies - Red Admirals, Large White, possibly Commas or Painted Ladies. Sea Aster and Golden Samphire may still be in flower, while in the sunny spots Grey Bush Crickets can be heard.